"Persian tas kebab includes quince, which turns the stew into an aromatic fusion of vegetables and meat. Season as desired and serve with naan." Pour oil into a pot. Cover the bottom of the pot with onions; add lamb. Season with 1/2 teaspoon salt, pepper, turmeric, and cinnamon. Layer garlic, ginger, prunes, carrots, quince, eggplant, and tomato onto the seasoned lamb. Sprinkle with 1 pinch of salt. Pour in water, tomato juice, and lemon juice. Cook, covered, over low heat, until lamb is tender, 2 to 2 1/2 hours. Add potatoes and cover. Cook until potatoes are soft, about 30 minutes. See how to make a traditional, hearty Irish stew. Substitute 2 green apples for the quince if desired. 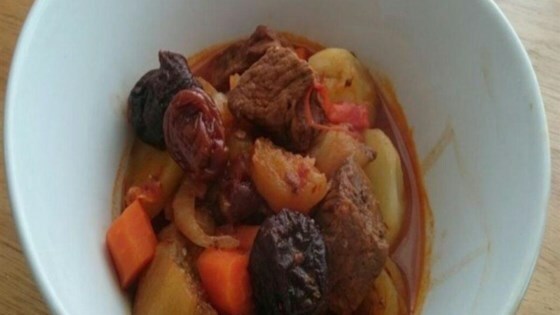 This stew can be cooked with lamb or beef and any vegetables desired.